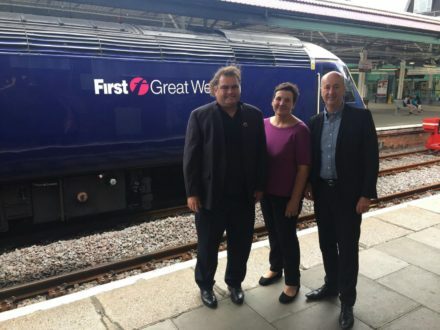 Rail union leader Manuel Cortes has travelled to Wales to meet with MPs and formulate a response to the Tory betrayal on rail electrification. Cortes, the general secretary of TSSA, met with Swansea West’s Geraint Davies and Gower’s Tonia Antonazzi to begin plans to fight back against the scrapping of electrification or key rail lines. “People in Gower will think again before believing Tory election promises. We now need to look at ways forward that we can deliver rail electrification despite this U-turn. It’s vital for the local area on both an economic and environmental point of view, and we have to think outside of the box on how to deliver this project,” she added. “But there’s more than one way to hold the Tories to account for breaking their promises. I will be meeting Geraint and Tonia today to discuss kickstarting a new campaign in Wales which keeps the upgrading of rail across the country – not just in South Wales – at the top of the political agenda. And one which makes the Tories pay at the ballot box for the contempt they have shown to Wales with the rail U-turn,” the union general secretary added.